Welcome to the New England Complex Fluids Workgroup website. 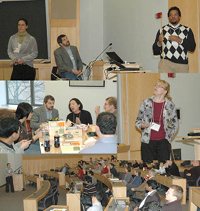 The workshop encourages collaboration among researchers from industry and academe studying Soft Condensed Matter. Workshops are held four times a year to offer opportunities for discussion and exchange. You must be a member to view the workshop archives or to register for an upcoming workshop. Register to be an NECF Member, and then login at the Member Login page. The workshops are engaging and very informative; note the following dates into your calendar.